Reacts against lamin A exclusively (the antibody was raised against the carboxy-terminus of 98 amino acids present in lamin A and absent from lamin C. As a result, this antibody recognizes lamin A but not lamin C; See Machiels et al 1997). Lamins do not appear to be universally distributed among different cell and tissue types. ab8980 has been tested in testis parenchyma and testicular germ cell tumours (See Machiels et al 1997). Other cell/tissue types have not been tested. Recombinant fragment corresponding to Human Lamin A (C terminal). Around aa 598 to 611. Mouse heart normal tissue lysate - total protein (ab30291) can be used as a positive control in WB. This antibody gave a positive signal in the following cell types: HeLa. This IgG3 antibody has to be purified from the culture medium by ion-exchange chromatography, therefore it will contain remnants of bovine serum albumin. Our Abpromise guarantee covers the use of ab8980 in the following tested applications. WB 1/100 - 1/1000. Predicted molecular weight: 74 kDa. PubMed: 92745311/1000. Predicted molecular weight: 74 kDa. Lamins are components of the nuclear lamina, a fibrous layer on the nucleoplasmic side of the inner nuclear membrane, which is thought to provide a framework for the nuclear envelope and may also interact with chromatin. Lamin A and C are present in equal amounts in the lamina of mammals. Play an important role in nuclear assembly, chromatin organization, nuclear membrane and telomere dynamics. Prelamin-A/C can accelerate smooth muscle cell senescence. It acts to disrupt mitosis and induce DNA damage in vascular smooth muscle cells (VSMCs), leading to mitotic failure, genomic instability, and premature senescence. In the arteries, prelamin-A/C accumulation is not observed in young healthy vessels but is prevalent in medial vascular smooth muscle celle (VSMCs) from aged individuals and in atherosclerotic lesions, where it often colocalizes with senescent and degenerate VSMCs. Prelamin-A/C expression increases with age and disease. In normal aging, the accumulation of prelamin-A/C is caused in part by the down-regulation of ZMPSTE24/FACE1 in response to oxidative stress. Defects in LMNA are the cause of Emery-Dreifuss muscular dystrophy type 2 (EDMD2) [MIM:181350]. A degenerative myopathy characterized by weakness and atrophy of muscle without involvement of the nervous system, early contractures of the elbows, Achilles tendons and spine, and cardiomyopathy associated with cardiac conduction defects. Defects in LMNA are the cause of cardiomyopathy dilated type 1A (CMD1A) [MIM:115200]. Dilated cardiomyopathy is a disorder characterized by ventricular dilation and impaired systolic function, resulting in congestive heart failure and arrhythmia. Patients are at risk of premature death. Defects in LMNA are the cause of familial partial lipodystrophy type 2 (FPLD2) [MIM:151660]; also known as familial partial lipodystrophy Dunnigan type. A disorder characterized by the loss of subcutaneous adipose tissue in the lower parts of the body (limbs, buttocks, trunk). It is accompanied by an accumulation of adipose tissue in the face and neck causing a double chin, fat neck, or cushingoid appearance. Adipose tissue may also accumulate in the axillae, back, labia majora, and intraabdominal region. Affected patients are insulin-resistant and may develop glucose intolerance and diabetes mellitus after age 20 years, hypertriglyceridemia, and low levels of high density lipoprotein cholesterol. Defects in LMNA are the cause of limb-girdle muscular dystrophy type 1B (LGMD1B) [MIM:159001]. LGMD1B is an autosomal dominant degenerative myopathy with age-related atrioventricular cardiac conduction disturbances, dilated cardiomyopathy, and the absence of early contractures. LGMD1B is characterized by slowly progressive skeletal muscle weakness of the hip and shoulder girdles. Muscle biopsy shows mild dystrophic changes. Defects in LMNA are the cause of Charcot-Marie-Tooth disease type 2B1 (CMT2B1) [MIM:605588]. CMT2B1 is a form of Charcot-Marie-Tooth disease, the most common inherited disorder of the peripheral nervous system. Charcot-Marie-Tooth disease is classified in two main groups on the basis of electrophysiologic properties and histopathology: primary peripheral demyelinating neuropathy or CMT1, and primary peripheral axonal neuropathy or CMT2. Neuropathies of the CMT2 group are characterized by signs of axonal regeneration in the absence of obvious myelin alterations, normal or slightly reduced nerve conduction velocities, and progressive distal muscle weakness and atrophy. CMT2B1 inheritance is autosomal recessive. Defects in LMNA are the cause of Hutchinson-Gilford progeria syndrome (HGPS) [MIM:176670]. HGPS is a rare genetic disorder characterized by features reminiscent of marked premature aging. Note=HGPS is caused by the toxic accumulation of a mutant form of lamin-A/C. This mutant protein, called progerin, acts to deregulate mitosis and DNA damage signaling, leading to premature cell death and senescence. Progerin lacks the conserved ZMPSTE24/FACE1 cleavage site and therefore remains permanently farnesylated. Thus, although it can enter the nucleus and associate with the nuclear envelope, it cannot incorporate normally into the nuclear lamina. Defects in LMNA are the cause of cardiomyopathy dilated with hypergonadotropic hypogonadism (CMDHH) [MIM:212112]. A disorder characterized by the association of genital anomalies, hypergonadotropic hypogonadism and dilated cardiomyopathy. Patients can present other variable clinical manifestations including mental retardation, skeletal anomalies, scleroderma-like skin, graying and thinning of hair, osteoporosis. Dilated cardiomyopathy is characterized by ventricular dilation and impaired systolic function, resulting in congestive heart failure and arrhythmia. Defects in LMNA are the cause of mandibuloacral dysplasia with type A lipodystrophy (MADA) [MIM:248370]. A disorder characterized by mandibular and clavicular hypoplasia, acroosteolysis, delayed closure of the cranial suture, progeroide appearance, partial alopecia, soft tissue calcinosis, joint contractures, and partial lipodystrophy with loss of subcutaneous fat from the extremities. Adipose tissue in the face, neck and trunk is normal or increased. Defects in LMNA are a cause of lethal tight skin contracture syndrome (LTSCS) [MIM:275210]; also known as restrictive dermopathy (RD). Lethal tight skin contracture syndrome is a rare disorder mainly characterized by intrauterine growth retardation, tight and rigid skin with erosions, prominent superficial vasculature and epidermal hyperkeratosis, facial features (small mouth, small pinched nose and micrognathia), sparse/absent eyelashes and eyebrows, mineralization defects of the skull, thin dysplastic clavicles, pulmonary hypoplasia, multiple joint contractures and an early neonatal lethal course. Liveborn children usually die within the first week of life. The overall prevalence of consanguineous cases suggested an autosomal recessive inheritance. Defects in LMNA are the cause of heart-hand syndrome Slovenian type (HHS-Slovenian) [MIM:610140]. Heart-hand syndrome (HHS) is a clinically and genetically heterogeneous disorder characterized by the co-occurrence of a congenital cardiac disease and limb malformations. Defects in LMNA are the cause of muscular dystrophy congenital LMNA-related (CMD-LMNA) [MIM:613205]. It is a form of congenital muscular dystrophy. Patients present at birth, or within the first few months of life, with hypotonia, muscle weakness and often with joint contractures. Proteolytic cleavage of the C-terminal of 18 residues of prelamin-A/C results in the production of lamin-A/C. The prelamin-A/C maturation pathway includes farnesylation of CAAX motif, ZMPSTE24/FACE1 mediated cleavage of the last three amino acids, methylation of the C-terminal cysteine and endoproteolytic removal of the last 15 C-terminal amino acids. Proteolytic cleavage requires prior farnesylation and methylation, and absence of these blocks cleavage. Sumoylation is necessary for the localization to the nuclear envelope. Farnesylation of prelamin-A/C facilitates nuclear envelope targeting. Nucleus. Nucleus envelope. Farnesylation of prelamin-A/C facilitates nuclear envelope targeting and subsequent cleaveage by ZMPSTE24/FACE1 to remove the farnesyl group produces mature lamin-A/C, which can then be inserted into the nuclear lamina. EMD is required for proper localization of non-farnesylated prelamin-A/C. ICC/IF image of ab8980 stained HeLa cells. The cells were 100% methanol fixed (5 min) and then incubated in 1%BSA / 10% normal goat serum (ab7481) / 0.3M glycine in 0.1% PBS-Tween for 1h to permeabilise the cells and block non-specific protein-protein interactions. The cells were then incubated with the antibody ab8980 at 1µg/ml overnight at +4°C. The secondary antibody (green) was DyLight® 488 goat anti- mouse (ab96879) IgG (H+L) used at a 1/1000 dilution for 1h. Alexa Fluor® 594 WGA was used to label plasma membranes (red) at a 1/200 dilution for 1h. DAPI was used to stain the cell nuclei (blue) at a concentration of 1.43µM. ab8980 staining of Lamin A in adult mouse liver sections. Formaldehyde-fixed paraffin-embedded sections of mouse liver tissue were incubated with ab8980 (1/2500) fo 2 hours. Antigen retrieval was performed by heat induction in citrate buffer pH 6.0 (ab64214). Please see accompanying abreview for additional information. Overlay histogram showing HeLa cells stained with ab8980 (red line). The cells were fixed with methanol (5 min) and then permeabilized with 0.1% PBS-Tween for 20 min. The cells were then incubated in 1x PBS / 10% normal goat serum / 0.3M glycine to block non-specific protein-protein interactions followed by the antibody (ab8980, 1/100 dilution) for 30 min at 22°C. The secondary antibody used was DyLight® 488 goat anti-mouse IgG (H+L) (ab96879) at 1/500 dilution for 30 min at 22°C. Isotype control antibody (black line) was mouse IgG3 [MG3-35] (2µg/1x106 cells) used under the same conditions. Acquisition of >5,000 events was performed. This antibody gave a decreased signal in HeLa cells fixed with 4% paraformaldehyde (10 min)/permeabilized with 0.1% PBS-Tween used under the same conditions. These images show HeLa cells stained with Laminin A antibody - ab8980 (green) and with DAPI (blue). The pictures were kindly supplied as part of the review submitted by Dr Josef Gotzmann at Medical University of Vienna, Austria. Immunohistochemistry on paraffin section of human colon. Immunohistochemistry on frozen sections of human colon showing nuclear lamina staining in epithelial and connective tissue cells. Publishing research using ab8980? Please let us know so that we can cite the reference in this datasheet. I wanted to ask a question about the antibody: ‘Anti-Lamin A antibody [133A2] (ab8980)’. Does this antibody also stain positive for progerin, and has this been tested by you or any of your customers? Since it is monoclonal we need to be sure whether it also stains for progerin. Thanks in advance for your answer. 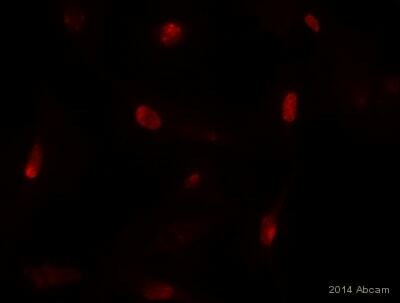 We have not previously tested whether this antibody stains progerin. The epitope of ab8980 corresponds to amino acids 598-611.According to uniprot (http://www.uniprot.org/uniprot/P02545), progerin lacks amino acids 607-656. There is therefore 62% of the epitope amino acids present in progerin so it could react however we cannot guarantee this. If you would like an anti-lamin A antibody which will also detect progerin, I could recommend Anti-Lamin A antibody (ab26300) whose immunogen corresponds to amino acids 570 to 587 which are also present in progerin. I will test my blot with an alpha-tubulin antibody this week or the next week . Thanks! I will look forward to hearing from you soon. I used Subcellular Protein Fractionation Kit for Cultured Cells 78840 from Pierce. They said that the kit is compatible with mammalian cultured cells. So I can used for mouse samples. I have not used theses mouse fractions with an other antibody. 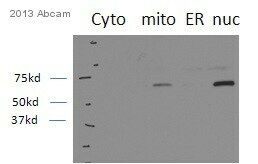 In my blot with lysates from mouse , I have proteins from extraction with RIPA-N and with fractionned extraction. And no band . So I don’t know what I should do. "In my blot with lysates from mouse , I have proteins from extraction with RIPA-N and with fractionned extraction. And no band." Does this mean you have performed cell lysis with RIPA buffer also and there was no band? Do you have other antibodies available e.g. anti actin or beta actin, anti GAPDH etc that can be used to against same lysates. If these antibodies shows positive results then we can assume that lysates are alright and the problem is due to antibody not the kit. Thanks! I will be looking forwardto hearing from you soon. Thank you for your email. I am sorry to hear that you have been experiencing problems with this antibody. The antibody has been characterized with mouse lysates and found to be specific to mouse protein, which is why we are selling this as mouse and human specific product. As the antibody is working well with human lysates so let's keep aside the quality of this, which seems OK. So the problem might be with the fractions prepared from KIT. Could you tell us the catalogue number of Pierce kit used. Is this kit suitable for mouse samples? Have you done any troubleshooting or used any other antibody than ab8980 with same fractions? I would suggest preparing mouse cell line lysates without fractions i.e. simple WB using RIPA or other lysis buffer and then checking the results. If antibody fails then antibody is damaged if not then protein extraction protocol might need further updates. Please let me know of your thoughts. I hope these suggestions would be helpful.